I'll wear my Christmas sweater with pride now. I hereby proclaim that, Forthwith my Fashions shall be Fortified with Festive Frivolous Faux Pas! Awesome post! I giggled at all of your f-words. I wish I had a Christmas sweater. (really!) Never cared much for fruit cake though. Oh.My.Gosh. Kim, you always make me laugh!! This is why I love your blog...I can always guarantee that you will lighten my mood and make me laugh (even though one of my kids is running around naked without a diaper on and will more than likely poop all over the carpet any minute but I'm in too good of a mood now to care). Hey, I'm all for Christmas spirit!!! Bring on the festive sweaters, the fudge, the fruitcake!!! I am CRYING right now from laughter. You are so freaking witty and hilarious! I have to email this to twindada, he will appreciate it! I used to have a sweater that said, "Ho, Ho, Ho" and then I got self conscious and got rid of it...I just might have to go out and find me another one! I am kind of fired up about this now, thanks! Oh mercy! Twinmama sent me over here cause I posted about my sister's detest of Christmas sweater, but I can get away with Christmas Jammies. That sweater on your kid is HILARIOUS!!! She's gonna LOVE that pic someday! Oh, and pass them thar' mashed potatoes, please! I left a store in Anchorage the other day, because as I waited in line the woman at the counter was SO careful to wish "Have a happy Holiday" to each person. I told her, "You do know the holiday you are wishing them, right? Its CHRISTMAS!" and then I left. I said it nicely, but I had to say it. This is hilarious! I love it!!! And you make a good point. Honestly, I think Christmas sweaters get a bad rap. Just like everything else, there are tacky ones and classy ones. And there are people who seem to turn their body into a Christmas tree from Black Friday until New Years Eve, a new sweater each day. Everything in moderation...those who go overboard ruin it for everyone. For the record, I have five Christmas short-sleeved T-shirts, that I wear over long-sleeved T-shirts. It was all I could do to keep from laughing out loud at work. Wonderful post! My mom goes around complaining about Christmas, but she has more Christmas wearables than anyone I know so I think she must secretly love Christmas either that or she's really got a thing for tacky, ahem, festive clothing and accessories. 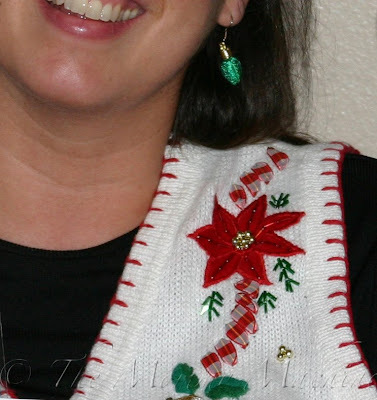 I don't have any Christmas sweaters anymore, but I suddenly have the urge to break out my jingle bell earrings! I hate fruit cake. Die fruit cake tradition. 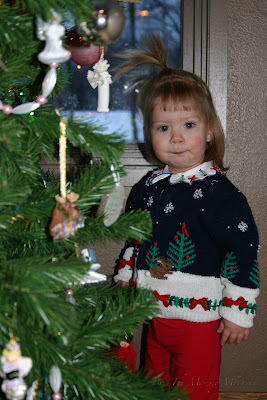 But I think my children look darling in their Christmas sweaters. And my mom will never stop wearing the blinking earrings. Absolutely hilarious! And i'm SO with you on the stern "Happy HOLIDAYS" corrections. Drives ya nuts! I have to disagree with the fruit cake, though. Nasty, nasty stuff.